© Copyright John Palmer. This is work in progress, last updated 2017-04-27. Please use this link to send me comments and suggestions. desc Tomalin: Illus. G3. Anchor. Purbeck marble. Height 68cm, max. width 46cm, thickness 11.5cm. Rope-hole at top is straight-bored and 8cm dia. The holes for the wooden flukes near the base are square-cut 6cm by 6cm. Recovered from the seabed at Yarmouth Roads. For general type see Nikolaou and Catling 1968 and McCaslin 1980.
desc Display card: Stone anchor of PM, 83.5kg. Isosceles triangular slab, worn circular rope hole at narrowest point, two square holes about 80mm square penetrating from one flat side to the other near the two obtuse angles. Symbol of a cross with two crossbars engraved on each side [ not easily seen ]. Probably medieval though earlier date possible. desc Durham and Fulford present details of at least 57 counters, most of which are described as 'Lias limestone' simply. A few are inscribed. Also (p.311) eleven Roundels, which are slightly larger discs. 16 counters and 3 roundels are drawn in fig.181 p.308. 2 of the roundels are described as PM, 2 shelly limestone, 2 oolitic, 6 limestone unspecified, one without specified lithology. subst Limestone, exact lithology rather uncertain. desc Stone counters: chalk and various limestones. the latter finegrained and oolitic types, prob.`Purbeck Portland', perhaps between Portesham and Worbarrow. comment See also Architectural section. desc Loom-weight of Purbeck Marble. Associated with a burr-stone mortarium. desc Durham and Fulford: 105. SF 3070. Cross ditch 3, layer 2. Weight with a distinct central waist. Portland freestone. Length 83mm, max. width 62mm. Drawing, fig.183 p.315. desc Loomweight, found during excavations at the villa. Originally a roof tile of Purbeck limestone, reshaped apparently to form a loomweight. 80mm diam, 12mm thick. subst PM (some of them). comment see Frere's Verulamium palette"
desc Palette of PM 76 by 66 by 13mm, one end broken and subsequently smoothed, the other 3 sides bevelled. Upper side polished and worn in center, the lower surface smooth. 57 Y III 2. Mediaeval layer. Ins XXVIII, 1. Above Room 11.
desc L-shaped pestle of PM `severely decayed, through chemical etching ... virtually none of the original surface survives ... similar to a RB pestle from Colchester' (Crummy 1983, p.77, fig.80, no.2087). Length 95mm, head 78mm wide, 30mm thick; associated with Worgret PM Mortar q.v. desc Inspected by JP 2010-03-05: limestone pestle, L-shaped, between extremities 120mm, longest side 90, next longest 75, breadth of broadest arm 50. Bad chemical erosion. Looks rather like BSL in the round, but photo consistent with PM. comment Context given as 136, which differs from 168 for the associated mortar. desc L-shaped pestle, site unknown. Purbeck Burrstone. Long dimension about 100mm. desc Donated by C. E. Bean, Sherborne. Pestle of PM, RB. Surface find [as above]. desc A Purbeck marble pestle, L-shaped, photographed from the side. Photo as published. Maximum dimension of grinding face 5cm. End of handle portion pointed. comment seems different from the pestle illustrated by ?Bernard Calkin in the same photo as the Dorchester 1886 mortar. desc Base of a Purbeck Marble pestle, handle broken off. From the infill (87) of building 707, phase 7. Illus. p.107, fig.57, no.261. Cf. complete example from Silchester and that illustrated by Beavis. desc 110b. SF 1328. Grid 13, Town-house (Building 182). Probably found associated with a mortar in room 18, pit 1, layer 4. Elbow-shaped, length of long arm 82mm. Purbeck marble. desc 113. SF 1779. Pit 207b. Elbow-shaped pestle damaged both ends, oval section, length 105mm. Purbeck marble. desc 114. SF 1892. Grid 2N, Town-house (Building 182), layer 4. Tapered pestle with circular cross-section, damaged both ends, length 92mm. Purbeck marble. desc 115. SF 2260. Grid 22E, layer 2. Elbow-shaped pestle, damaged both ends, oval section, length of long arm 95mm. Purbeck marble. desc 122. SF 4402, Grid 116SE, road cut 7, on road surface. Small elbow-shaped pestle, broken one end, oval section 33mm by 30mm. Purbeck marble. desc 136. SF 1652, Grid 12, Town-house (Building 182), layer 4e. Elbow-shaped pestle, broken one end, circular cross-section. desc Pestle of PM. Room B.XI, on the period B.3 floor. The figure shows it as a slightly tapered cylinder with the narrower end (which would have been used in the palm of the hand) rounded, length about 70mm, broad end diameter about 35mm. desc Pestles 2. Beavis: Well carved and polished in contrast to local stone pestles. Illus. by Beavis p.190. comment In spite of what it says at Sunter and Woodward p.37, these are definitely not nos.19 and 20 in the microfiche part of that report. comment The present two items are also listed in the Tools section of this database. comment what's a flag hone? desc Rubber of light grey stone, possibly a Purbeck variant. Suitably heavy for use in a mortar but too heavy for a pottery mortarium. loc ?Museum of Reading, or Stratfield Saye? desc Complete topstone of Purbeck limestone/marble. A circular tapering handle socket on side with second (handle?) groove on top. 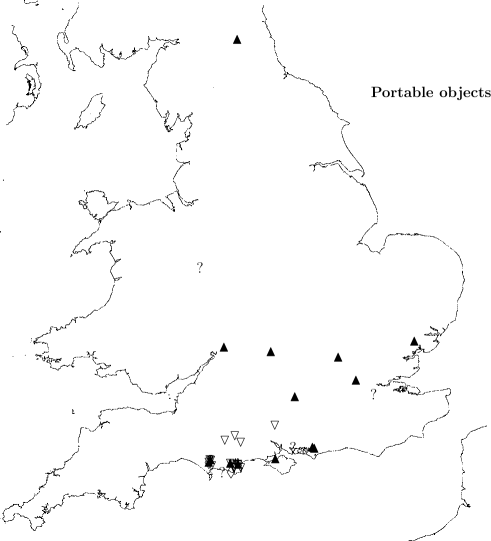 Similar to example noted at Maiden Castle (Wheeler 1943 fig. 115.16). From dryer (708), phase 7. Illus. p.107, fig.57, nos.258-260. desc p.117: complete lower stone of a rotary quern, 390mm diam. Broken shell bed of Purbeck [i.e. Broken Shell Limestone, DB220: JP]. SF 613, area of Building 16, period 4.
desc Pitt-Rivers pl.50 shows two quern fragments, no.3 ``top view and section of a quern about 2ft diam. found in surface trenching interior of NW quarter [ higher-status area ]; 21 frags of querns found [ there ]''; and no.4 ``frag of top stone of a quern ... with square groove, diam. 2ft 3in, found in surface trenching in interior of central quarter NE side; 2 other such fragments found [ there ]''. desc ?Limestone? rotary quern lower stone from Maiden Castle, Wheeler excav. Complete but in two pieces. subst PL ? DB220 ? desc Hassall and Rhodes: ... rectangular moulded base with animal feet at the four corners and a socket in the top surface for the end of the shaft. The base originally measured 28 by 28cm [overall] by 10cm high ... the socket hole ... 9cm square by 5cm deep. date Apparently unstratified. Roman military occupation from after 64 till at least 78, civil then till C4. desc Context 2267; Weight; spherical shape truncated top and bottom, two sunken holes on top, iron-staining and fracture lines in holes, mass 764.2g (about 2 1/2 Roman pounds! ); two oval iron-stained sockets on top about 25 by 15 by 18mm deep, 3 depressions at bottom of each hole app. from process of drilling out the holes. comment Boon: `it is hoped that Mr W. Solley of Bristol will shortly publish his corpus of examples'. This has since appeared as Solley 1979 (referred to also in Boon 1981). grid SY 94 86 approx.